Though a great many firearm injuries sustained by children result from the negligent storage of firearms, such injuries may also occur as a result of a defect in a firearm’s manufacture or design. When an adult uses a defective firearm while a child is nearby, a malfunction may injure not only the user but the child bystander, as well. Even when minors are using a weapon and are properly supervised and trained in the use of firearms, tragedy may nevertheless result when a defective firearm malfunctions. If your child has been injured by a defective firearm, defective-firearm and child injury attorney Jeffrey Killino has the right combination of knowledge and experience to ensure that you receive the compensation to which you are entitled. Call attorney Killino at 877-875-2927 for compassionate yet aggressive assistance with your case. Firearms are used in the United States for self-defense, recreation, and hunting. Weapons carry a high level of inherent risk and danger for all involved, but when the risk comes from a defect in the firearm itself, accidents leading to injury or death are far more difficult to prevent. Defects in firearms may increase the risk of weapon misfire, explosion, injury, or death, putting adults and children at extreme risk. 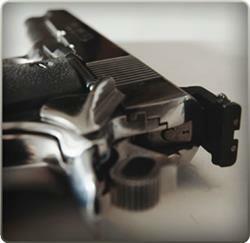 A defectively designed or manufactured firearm can malfunction without warning and at any time. Defective firearms have been reported to discharge even with safety mechanisms engaged and without a user’s finger on the trigger. Guns are not subject to the same sorts of consumer product safety standards as are many other items purchased and used by the general public. The Federal Consumer Product Safety Act (codified at 15 U.S.C. §§ 2051-2089), which prescribes health and safety standards for a wide array of consumer products, specifically exempts firearms and ammunition from the Act’s purview. Though some states have enacted their own laws that impose safety requirements regarding the design and manufacture of firearms, many states have not. State laws regulating firearm design may include provisions requiring the inclusion of certain safety features or certain types of testing—such as drop and fire testing—before the firearm can be sold in that state. Historically, in states that had not enacted firearm-design legislation, the only method by which manufacturers could be persuaded to implement safety features into their designs was the institution of civil product-liability litigation. Certain legal actions against firearms manufacturers have been severely curtailed by federal laws designed to protect the gun-manufacturing industry. The Protection of Lawful Commerce in Arms Act, enacted in 2005, provides for the dismissal of any lawsuit against a member of the gun industry for recklessly or negligently manufacturing or selling guns. Product-liability actions brought under a strict liability theory do not address or require proof of such behavior on the part of a product-liability defendant, however. Some states have enacted statutes specifically related to defective-firearm product-liability actions. Such a statute might provide, for example, that no firearm or ammunition that is the subject of a product-liability action may be considered defective in design on the basis that the benefits of the product do not outweigh the risk of injury posed by its potential to cause injury when discharged. The product-liability laws applicable to defective firearms vary from state to state, but generally provide that the seller as well as the manufacturer of a defective firearm whose defect is a cause of a plaintiff’s injury may be held liable for damages sustained in a product-liability action. Product-liability law also generally allows recovery against anyone in the chain of a product’s distribution. The manufacturer or distributor of a single component of a firearm may, therefore, be held liable in a product-liability action if the component’s defect is found to have been a cause of the plaintiff’s injuries. Product-liability law generally allows a plaintiff to recover damages that result from a defective-product injury if a defect in the product’s manufacture or design is found to have been a cause of the plaintiff’s injury. Such actions may also be brought when a product contains inadequate warnings or instructions. Thus, the sale of a firearm without adequate warnings of its dangers or without instructions regarding its safe use, storage, and maintenance may give rise to a product-liability claim if a plaintiff was injured as a result of the inadequate warnings or instructions. The law of product liability is complex in many respects, and requires the expertise of an attorney with knowledge and experience in this particular area of law. If your child was injured by a defective firearm, you may be entitled to compensation from the weapon’s manufacturer and anyone else in the chain of the weapon’s distribution. Defective-firearm and child-injury lawyer Jeffrey Killino has tremendous experience and knowledge in the law of weapon liability and will counsel you through the legal process with patience and compassion. Contact attorney Jeffrey Killino at 877-875-2927 today for a free evaluation of your case.